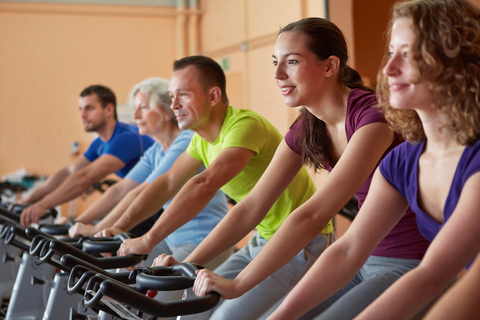 We offer a variety of exciting and fun group exercise classes in our 1,000 square foot class room. High ceilings, mirrored walls, high-tech cushioned sport flooring will all make your exercise experience more rewarding. Dance your way to fitness! This dance-based cardio class incorporates a wide variety of medium and low-impact aerobic dance moves to a variety of high-energy beats. It’s like a dance party! An all-inclusive, dynamic, and multifaceted class designed to improve your overall fitness level; including strength and flexibility. 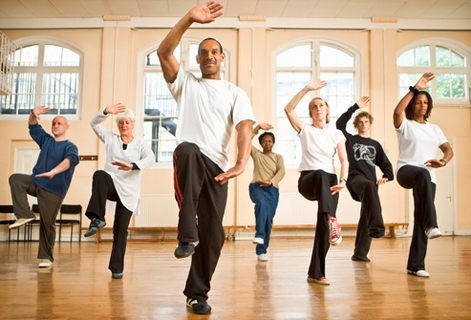 For all fitness levels: Class that includes 5 elements: Aerobics, Strength, Balance, Core and Stretching. Bootcamp inspired, a fun full-body workout that provides cardio, strength, and core work through circuits and intervals with an ever-changing format to keep your body guessing! Take a break from work and come take a 30 minute abbreviated version of Cardio Kickboxing, to keep your energy up for the rest of the day. (aka: High Intensity Interval Training) Designed to increase physical strength as well as your cardiovascular endurance through high-intensity movements. Cardio based class that will get the heart pumping and burn calories, never skip a Monday workout! A 45 minute low-impact high energy cardiovascular class performed on a spinning bike. A thirty (30) minute class focusing on stretching. TRX leverages gravity and your own body weight to build strength, balance, coordination, flexibility, core and joint stability. This class emphasizes a balance between strength and flexibility, the building of endurance and the development of self-awareness. Pull, squat, lunge, rotate and plank your way to better in this total body workout. From the warm up to the cool down, this workout will be taught 100% on the straps utilizing reps and tempo. You can control how much you want to challenge yourself by simply adjusting your body position to add or decrease resistance. 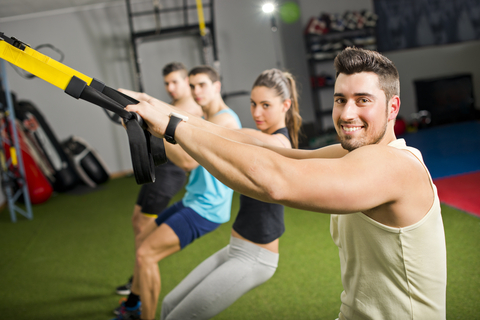 TRX delivers a fast, effective total-body workout; helps build your core, increase muscular endurance and benefits people of all fitness levels! A 50 minute low-impact high energy cardiovascular class performed on a spinning bike. No matter what your fitness level, everyone will achieve results. There are no complicated movements and the resistance and speed is adaptable to your fitness level. Your instructor will guide you on a journey where you will be changing resistance and speed through high energy intervals while listening to your favorite music. You will burn between 400 - 600 calories per session. So bring your water bottle and your energy and expect to build strength and improve your overall fitness level. A creative and fun Vinyasa class set to great music that will take you out of your head and into your body. Get ready to sweat and lose yourself in the moment and flow in some serious beats. Do you wake up with a stiff back? Are you not as flexible as you used to be? Back on Track will help you learn how to improve your back health through a programmed series of stretches and body weight exercises – all under the direction of one of our certified personal trainers. This class will be a combination of assisted stretching, modified yoga poses, TRX and mat exercises. Looking for a great way to start your day? Enjoy exercises in which you move your body into various positions to become more flexible while focusing on breathing, and relaxing your mind. A class designated to increasing the strength and endurance of the muscles of the core (abs, back, gluteal + torso). Core Strength and endurance helps us function at a higher level to both enhance our athletic endeavors and increase our daily quality of life. A full body functional training class. 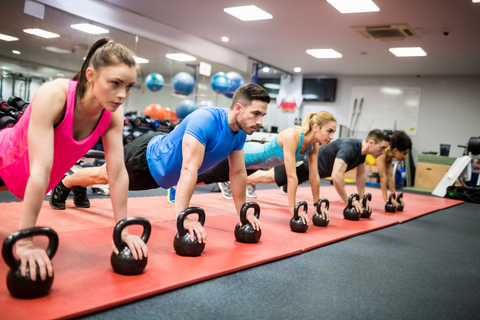 Exercises are designed to train, develop, and use various muscles in the upper and lower body at the same time to make it easier and safer to perform everyday activities. Functional exercises also emphasize core stability. Class will incorporate use of fitness balls, kettle bells, battling ropes and weights. Want to increase your endurance while strengthening your core? Cardio Core + More is a combination of H.I.I.T and core (abs, back, glutes and torso) exercises. Core strength and endurance help us function at a higher level and increase our daily quality of life. ViPR: (Vitality, Performance, and Reconditioning) Versatile training tool that can be carried, tilted, dragged, thrown, flipped, and rolled, your body will be challenged across all three planes of motion for a full body workout. ViPR builds agile strength to prepare you for any physical challenge. It combines whole-body movement patterns to help you move better, become fitter and feel stronger for life and sport. All Levels: Balance your energy for the entire day…. Enjoy a warm room while focusing on maintaining proper alignment throughout each posture to bring balance, strength and agility to the mind and body.